Synthetic peptide (Human) - non-phosphopeptide derived from human CREB around the phosphorylation site of Serine 133. Our Abpromise guarantee covers the use of ab31387 in the following tested applications. WB 1/500 - 1/1000. Predicted molecular weight: 37 kDa. 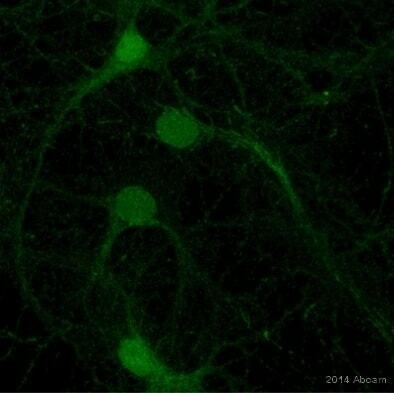 ICC/IF image of ab31387 stained A549 cells. The cells were 4% formaldehyde fixed (10 min) and then incubated in 1%BSA / 10% normal goat serum / 0.3M glycine in 0.1% PBS-Tween for 1h to permeabilise the cells and block non-specific protein-protein interactions. The cells were then incubated with the antibody ab31387 at 1µg/ml overnight at +4°C. The secondary antibody (green) was DyLight® 488 goat anti- rabbit (ab96899) IgG (H+L) used at a 1/250 dilution for 1h. Alexa Fluor® 594 WGA was used to label plasma membranes (red) at a 1/200 dilution for 1h. DAPI was used to stain the cell nuclei (blue) at a concentration of 1.43µM. Immunohistochemical analysis of paraffin embedded breast carcinoma tissue sections, using 1/50 ab31387. Left: Untreated sample; Right: Sample treated with synthesized peptide (negative control). Publishing research using ab31387? Please let us know so that we can cite the reference in this datasheet. Can you please send me MSDS documents for ab28839 and ab31387? Thank you for contacting us. Please find the requested MSDS documents attached. Please let me know if you need any additional information. What does Abcam consider enrichment for ChIP? I am getting 0.09-fold enrichment over input for CREB and 0 for my negative control, but 1.5-fold for my positive control. Thank you for contacting us. I have asked the lab what they consider a positive ChIP result. I think they will want to know how you calculated the 0.09 - fold enrichment. You also mentiioned a 1.5 - fold enrichment for a positive control. Can you tell me what that control was? There can be a wide range of values depending on the calculation. 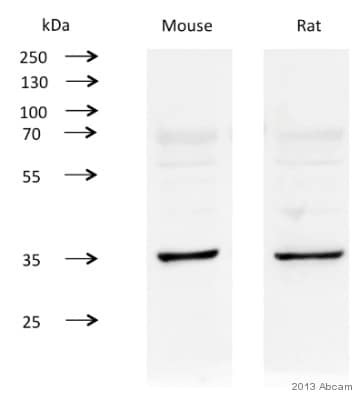 For example, the datasheet for our popular histone H3 antibody ab1791 has ChIP data values well below 0.09 but those values are presented as evidence of the antibody's efficacy. On the other hand, at least one customer review of the same antibody has data with values between 1 and 3. Have you checked crossreactivity of this antibody with other ATF family members such as ATF-1? Do you have more available references about using this antibody in ChIPs expts? Gracias por ponerse en contacto con nosotros. Hemos llevado a cabo un alineamiento de secuencia mediante BLAST, y existe un 92% de coincidencia con ATF-1. Aunque nosotros no lo hemos testado específicamente en el laboratorio, es muy posible que exista reactividad cruzada entre ambas proteínas. Respecto a las referencias solicitadas, siento no poder ofrecerle ninguna otra referencia en cuanto al uso de este anticuerpo en ChIPs. Toda la información disponible se encuentra en la ficha técnica del producto y tan pronto como dispongamos de información adicional, ésta será actualizada en las datasheets. Espero que esta información le sea de utilidad. Por favor, para cualquier otra duda, información o sugerencia, no dude en ponerse en contacto con nosotros.